Humans are not good at keeping their resolutions. We’re asking ourselves to change hardened habits, and few of us have the discipline to follow through. We here at The Takeout propose to, well, lower the bar to a manageable level: We’re dubbing it micro-resolutions. It’s not as ambitious as losing 30 pounds, earning a black belt in jiu jitsu or becoming fluent in Japanese. A micro-resolution involves dedicating 15 minutes—that’s all!—to finesse a skill we’ve never bothered to quite nail down. Over the next week, The Takeout staff will reveal the skills and techniques we’re finally going to invest time learning. For me, it’s correctly chopping an onion. I swear, I could actually chop an onion! But it’s never been better than a B+ job. There’s a fair bit of hesitation in my approach, and so my dice is not quite consistent. Look, when you’re sautéing down onions, they disappear into nothing so it doesn’t matter if they’re not all the same size. But achieving a uniform dice, even if it doesn’t affect the final dish, means I actually give a damn, and giving a damn with onions means I’ll give a damn elsewhere. That makes for better cooking. So I decided to finally dedicate 15 minutes to go from a B+ to a A+ with chopping onions. I bought three onions and got to work. There are countless YouTube tutorials that’ll show you proper technique, but I opted for Samin Nosrat’s Salt Fat Acid Heat (the book, not the Netflix series). Nosrat’s method is pretty much the standard method for chopping onions, which involves halving an onion, then knife cuts along three axes. Within 15 minutes, I was able to diagnose two things I’ve been screwing up all these years. First: When I halve my onion, I’ve been cutting it along the equator. What I really should’ve done all along was halve it through the poles—cutting through the root and stem (see upper left photo quadrant below). If you cut it through the equator, when you go for those knife cuts through the X, Y, and Z axis, pieces of onions will slip out from under, and that’s when your onion dices cease to lose its uniformity. Let the root end do all the work and hold the pieces together! The second revelation? I’ve been much too hesitant with my knife chops. Onion chopping must be approached with confidence, not timidity, because anything less than an authoritative downward cut will yield strange angles, halfway cuts, and worse yet, mishaps that require bandages. You gotta just go for it. Basically, YOLO, but for onions. 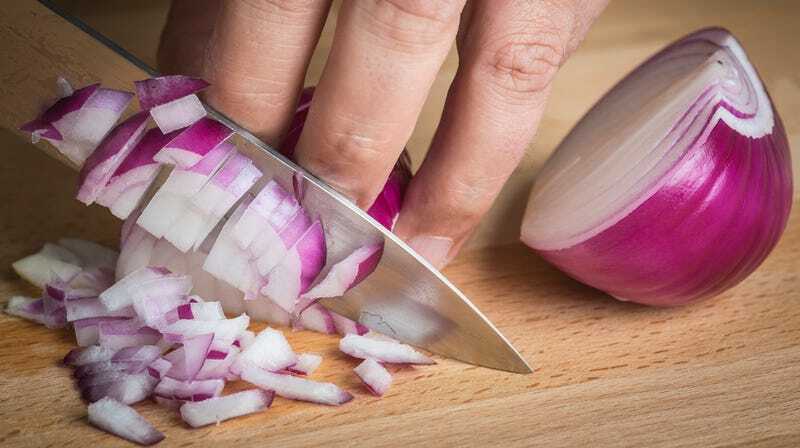 What are the exact steps of chopping an onion? The following assumes you’re a right-hander. Cut an onion in half through the root and stem, not the equator. Peel the outer skin off. With one of the onion halves on the cutting board, place root at 9 o’clock position and make 3-4 horizontal incision from the stem end until just before the root (as shown in upper right photo quadrant). Press down on onion with pinched fingers. If you’re left handed, place onion root at 3 o’clock position. Reconfigure orientation of root end to 12 o’clock. You’ll be making top-down cuts from right to left side—again, through the stem end until just before the root (lower left photo quadrant). Finally, turn root end to 9 o’clock position. Chop top-down from right to left, all the way to the cutting board, using your curled left fingers holding down the onion as guide (lower right quadrant). You’ve got diced onions! Repeat with other half of onion. Remember: Halve it through the poles! And approach each chop with confidence, without hesitation.